Here at Explore Wanaka we take our GOLF very seriously! We are just as passionate about playing the game as we are at getting our customers out there for the perfect round. Want to experience a world class championship course one day and then get off the beaten track to play at a little hidden gem the next? At Explore Wanaka we specialise in knowing all of the hidden gems. Our golf tours are all guided by passionate Wanaka locals who will ensure you an unforgettable trip, We are laid-back yet professional when it comes to getting our customers the best golfing experience. Golfing here is year-round so whatever your schedule we can arrange golf to suit you. Our golf packages range from a full package with airport and course transfers, accommodation and greens fees, to a custom tour where you can pick and choose you own itinerary and play specific courses of your choice. We really value our customers and treat them like family here at Explore Wanaka, and therefore we're always happy to go out of our way to try and ensure that every request is followed through. Whether you're teeing off with a turquoise lake behind you or chipping up to the green over-looking the snow-capped Southern Alps, the vistas here are as mighty as they are wide. Want raw, stunning beauty mixed with immaculate courses and overall perfection - then this is the area to play. A very stoked customer takes in a magical day at Millbrook . We have ten picturesque, amazing and completely unique courses right here in our back yard and all within one hours drive of each other. Interested in visiting during or around the dates of the NZ Open 28th Feb - 3rd March? Without doubt the busiest week of golfing here in the Southern Lakes. With four marvellous days of golfing action and plenty of options on hand it really is a hive of activity and action around the area. Split between Millbrook and The Hills, visitors and viewers alike get the chance to get up close and personal with some of the best golfers in the world. Feel like posting up with a deck chair next to the green or following the leading group around the course? There are plenty of options for you. This is a great chance for golfers, friends and business's alike to come together and network, share stories and experience the world class action. We will arrange tickets and transport to the open and airport transfers, luxury accommodation and your green fees for Jack’s Point and Wanaka plus a private host/driver, this is all included in the package. Trust us, this is the most exciting week in NZ golf and if you consider yourself a passionate golfer or fan you're not going to want to miss this! This stunning tour takes you to three of New Zealand's most scenic and beautiful courses. MillBrook and Jack's Point are world-class championship courses and offer the very best in conditions and scenery. The Wanaka Golf Club has some of the most spectacular views and needs to be experienced to be believed. The Southern Lakes tour will certainly not disappoint. This tour is an absolute must and gives you the chance to play and take in the five beautiful Central Otago classics. These courses are all superbly maintained and offer the golfer a great mix of challenge and enjoyment without feeling like your teeing off on the world stage and everybody's watching! Want to experience Central Otago and all it offers? Then you will absolutely love these five gems. 5 rounds of golf/ green fees - Wanaka, Cromwell, Alexandra, Arrowtown and Queenstown golf clubs. This is our more affordable tour and is a great option if you are only spending a small amount of time in the area but still want to get out and have a quick hit in between experiencing all of the adventure. Central Otago is one of the most raw and untouched parts of N.Z and these three stunning courses are a good representation of that. They will give you everything you could ask for in variety, peace and privacy mixed and showing off the unique style of Central Otago golf. Staying in Wanaka or Queenstown and want to play the courses that the pros play but don't want to break the bank? 'Over the Crown' tour will suit you perfectly. Wanaka an QT are absolute golf meccas! Often the courses included here get a little over-looked and dwafted by the surrounding hype of the big boys. Not to be outdone Wanaka, Queenstown and Arrowntown all offer the very best in quality golfing experience within their own rights. These three courses are still amazingly world-class but have a slightly smaller and 'local' feel to them. We can promise here that you'll love each of them! In addition to our golfing packages we also offer custom golfing options where you can pick an choose which course or course's you'd like to play at a time and schedule that suits you, If your on a tight time frame or don't require accommodation/ transport this is a great option to consider . We also pride ourselves on the fact we offer exclusive high-end private lodging and heli transfers for all our guests if required. Wanaka Golf Club, without a doubt, has some of the best views in the Southern Lakes region. The course is smack-bang in the middle of town but its well established trees and layout give it a good private, yet welcoming feel. A growing community and expanding town, matched with the natural beauty of Wanaka itself, puts this very high on the list of courses to play. Play it anytime of the year. Winter with the snow-capped surrounding mountains or in autumn when then leaves are a mix of golden yellow to deep red - it's stunning. 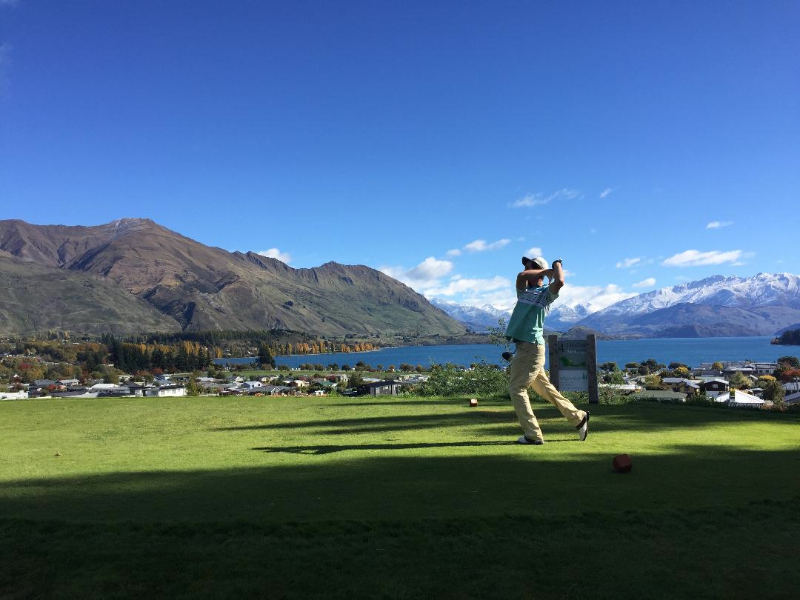 Wanaka Golf Course is a must-do on any golfers trip to N.Z. Formally Kelvin Heights, Queenstown Golf Club has undergone some amazing renovations and proves to be one of the great hidden gems in the area. QTGC offers amazing views of Lake Wakatipu from every hole and with the stunning Remarkables Range as the back drop it's hard to keep your head down when playing here. Its location is a very handy 20 minutes from down town Queenstown or just one hour over the hill from Wanaka, this course never disappoints and when you play here you'll see why. Without a doubt the most prestigious and pre-eminent golf course here in the Southern Lakes area, Millbrook boasts an Incredible 27 hole world-class championship course. Home to the ISPS NZ Golf Open it hosts a number of international and national events and tournaments for good reason. Set in the dramatic but visually stunning Arrowtown basin, Millbrook is an absolute masterclass and offers up a golfing experience like no other. Surrounded by the stunning peaks of the Southern Lakes this year-round golf course really needs to be seen to be believed. We rate Millbrook as being right up there towards the top of any golfer's list.The course is always in immaculate condition and the facilities to are nothing short of outstanding. Just a short 30 minute drive down the road from Wanaka is the gem of Cromwell Golf Club. A stunning 18 hole championship course with a great mix of flow, natural landscape and raw beauty. It proves to be a very popular course with golfers from both N.Z and abroad. With sand-based greens and fairways it plays amazingly well, year round. Its claim is - " Being the most inland links course in N.Z. enjoy a challenge and think you can score well? This is a great course to test your skill and patience - highly recommend! Arrowtown Golf Club is a real diamond in the rough when it comes to courses that offer everything in the way of great golf in the Southern Lakes. It has a relaxed 'country club' feel but also incorporates diversity and challenge. Mixed in with the history of the area you'll be blown away by this amazing but low-key course. Arrowtown is a must see on any travellers list. Combine that with 18 holes at this amazing club and you've just ticked off a legitimate "must do" in this area. Visually one of the most spectacular courses you will ever play on and experience. Every single aspect of the course is outstanding. From the natural schist rock walls through to the immaculate condition of the greens and fairways. The course has been crafted using its own natural landscape and the views could quite possibly be the best N.Z has to offer? Not to be outdone by its raw beauty this is a world-class championship course that will challenge even the very best of golfers - make sure your camera is charged up as you will definitely need it here. The Alexandra Golf Clubs is a true favourite here at E-W and always comes with lots of praise from our customers and friends. Just a short drive down the road from Wanaka and over the hill from the Cromwell Golf Club, the Alexandra Golf Club is nestled in amongst the trees and rural surroundings, It is a links-style course with a tight feel but still plenty of space to open it up when teeing off. Being one of the more established clubs in the area with a rich history, a trip to Central Otago for any golfing traveller must also incorporate 18 holes at this stunning course. One of N.Z's most exclusive and private clubs - "The Hills" offers the absolute highest quality in golfing experience. Sir Michael Hill, N.Z entrepreneur and businessman, has established a world-class and immaculate golf course right here in the heart of the Southern Lakes. The Hills offers a complete package which includes; 18 holes, club /cart and equipment hire and a welcome gift pack. Breakfast /lunch and beverages to the customers request are also available as is exclusive use of the club house and restaurant . Picture yourself and your mates with the course to yourselves and the possibilities are endless! Combine that with this stunningly beautiful setting and a round here will be something to cherish forever.